A 2017 issue of The Triangle. 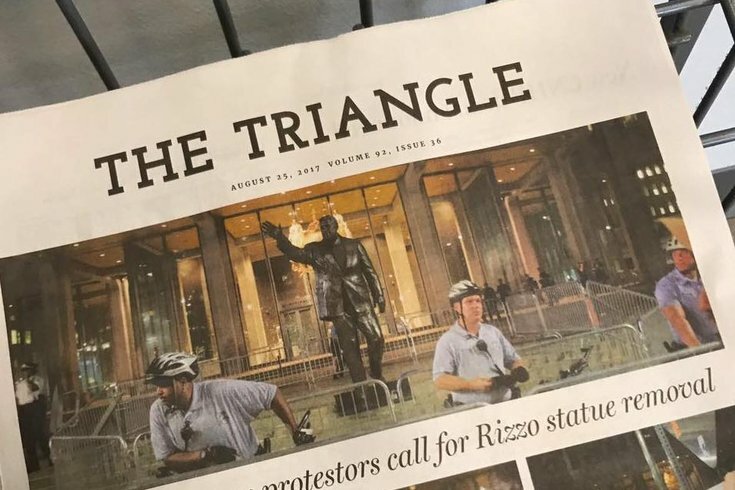 Drexel University’s student newspaper, The Triangle, is ceasing print publication for the first time since its founding in 1926. The newspaper, which prints once a week (and once every other week during summer terms), ran an editorial in its Jan. 25 edition informing readers of the organization’s situation, and asking for donations at this link. The Triangle's newsroom will continue to write articles to be published online. The Triangle doesn’t accept money from Drexel’s Student Activity Fee Allocation Committee in order to remain objective, per the newspaper’s original 1926 charter. "After our discussion tonight at our Editorial Board meeting, and after a long financial struggle, I'm saddened to announce The Triangle does not have enough money to print after this Friday. Although I've alluded toward our financial woes in past meetings, I will admit I've been hesitant to allowing news of our dire situation leave our circle of senior editors, and especially not to people outside our organization. But, this week's paper will include a write up of our situation as well as a request for the Drexel community to help support us monetarily in order to us get us back on our feet. As Triangle staff members, I wanted you all to know before it was published to the wider student body." "However, this does not mean the end for The Triangle. We will still meet every Wednesday and publish online just as we do now, although with fewer funds available." The print edition of the paper faced a similar situation in 2013, but the organization’s business department managed to keep the paper afloat by changing printers and cutting back on print page count down to just 12 pages. Avena told PhillyVoice the organization knew ending print publication was a possibility. In its last full fiscal year, The Triangle had lost $16,000. “We ended the year with almost no money in the bank,” said Avena, a senior who’s been Editor-in-Chief since June. The organization scrounged up some money it was owed from advertisers and continued to print, but when the school’s winter quarter ended in early December, they were effectively out of money. It was a surprise, he said, that The Triangle managed to hit newsstands the past three weeks. It wouldn't last a fourth. The idea of accepting SAFAC funds came up in editorial meetings, and they pitched it to advisor Scott Warnock, but ultimately the $3,000 or so they would’ve received from the school wouldn’t have been enough to move the needle, Avena said. Avena said there’s still hope, if the organization can raise enough money in the coming days and weeks, that a rebound can happen. He thinks there’s been an uptick in its consumption since the organization started a more aggressive on-campus distribution presence, and new additions have seen the staff’s count grow to 90 members. Losing the print edition just as momentum is starting to roll, Avena said, could sink it all — and in dangerous times for journalism. Disclosure: Adam Hermann wrote for, and edited, The Triangle from 2012 to 2016 as a Drexel student.